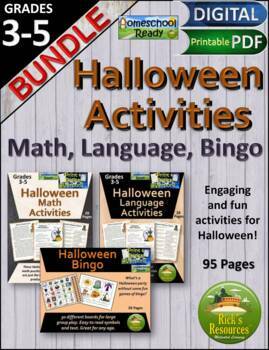 A spooktacular bundle for fun Halloween learning activities. Students engage in meaningful and motivating math, language, and bingo activities. Perfect for parties, centers, small group, or the whole class. The included language, math, bingo activities are appropriate for high grade 3, grade 4, grade 5. 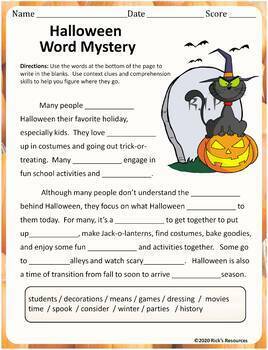 The Halloween language activities include reading comprehension article and questions and a variety of word problems, alphabetical order, spelling and puzzle activities - all with a Halloween theme and motivating riddles. The Halloween math activities include problem-solving, basic operations, and puzzles for kids to solve. The Halloween bingo game includes 30 boards and with a variety of fun Halloween symbols and calling cards.The Halloween worksheets are printable in either grayscale or color. Full answer keys are included for the math and language worksheets. Listed below are brief descriptions of each product and links to the actual products for more in-depth information. • Halloween Language Activities These Halloween language activities are a great way to keep kids productive and motivated around Halloween. Activities include reading a story and answering questions, word search, unscrambling letters, finding mystery words, ABC order, story writing, finding misspelled words, breaking codes, unscrambling words, word shapes, solving puzzles. 27 pages. 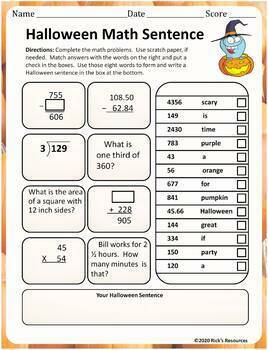 • Halloween Math Activities These twelve Halloween math activities (with answer keys) are a great way to keep kids motivated and productive around Halloween. Students can complete word problems, match answers, break codes, find patterns, complete puzzles - all while reviewing and reinforcing core math concepts and skills. 27 pages. • Halloween Bingo Game What's a Halloween party without bingo! 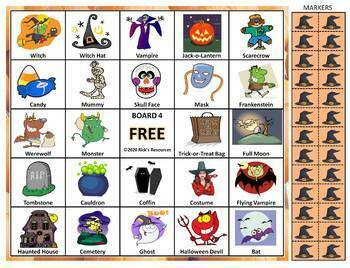 This is a carefully crafted Halloween bingo game that was developed specifically for classroom use. There are 30 different bingo boards to accommodate large groups. Each of the large calling cards includes a text description for ease of calling. All of the boards have clear and colorful graphics that also include text titles so participants can easily identify the symbol being called. 38 pages. I take pride in my products and guarantee satisfaction. Please let me know if you have any questions or comments about any of my materials. My name is Rick Whitehead and I am a teacher, author, tutor, and mentor. I worked in the public school system for 28 years and was involved in teaching, tutoring, curriculum development, administration, school program design and implementation. I am the author of juvenile fiction and many educational products to help students learn and grow. I am the proprietor of Rick's Resources. To follow me, click on the little "Follow Me" button by the green star right below my Rick's Resources store name that you can find on any of my pages. Followers can opt to receive notifications when new resources are posted and newsletters from me no more than once per month.